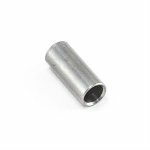 Rear stock pin bushing for all HK builds. Welds to the back of the folded flat and guides the push pin to correct position. Correct for all HK builds that use a large HK push pin for stock mounting.